The 1st. Web Accessibility Contest will be held by Ministry of Information and Communications and KADO for all students of univeristies and high schools. It requires a standard-accessible web site by paticipators. All students can make a team within 4 members and must submit their web pages. 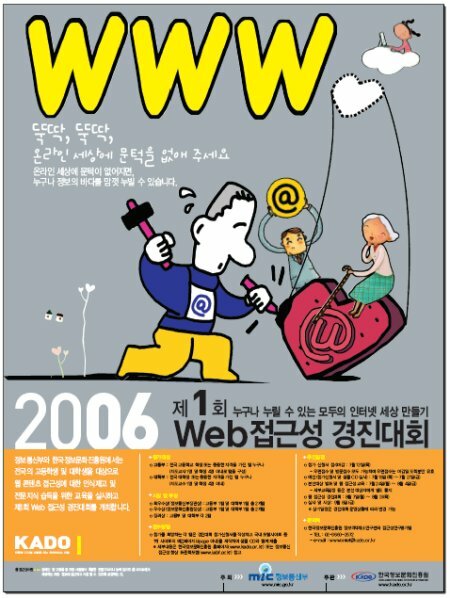 One of them will win a prize by korean ministry of information and communications with . You can contact Mr. Junho Hyun if you have any questions. The KADO presents an educatioal seminlar to all paticipators who are not good at web accesibility. Our members also will give a lecture for them. We are very proud of this content in Korea. Thanks for KADO again.